Welcome to the Raw Revolution! 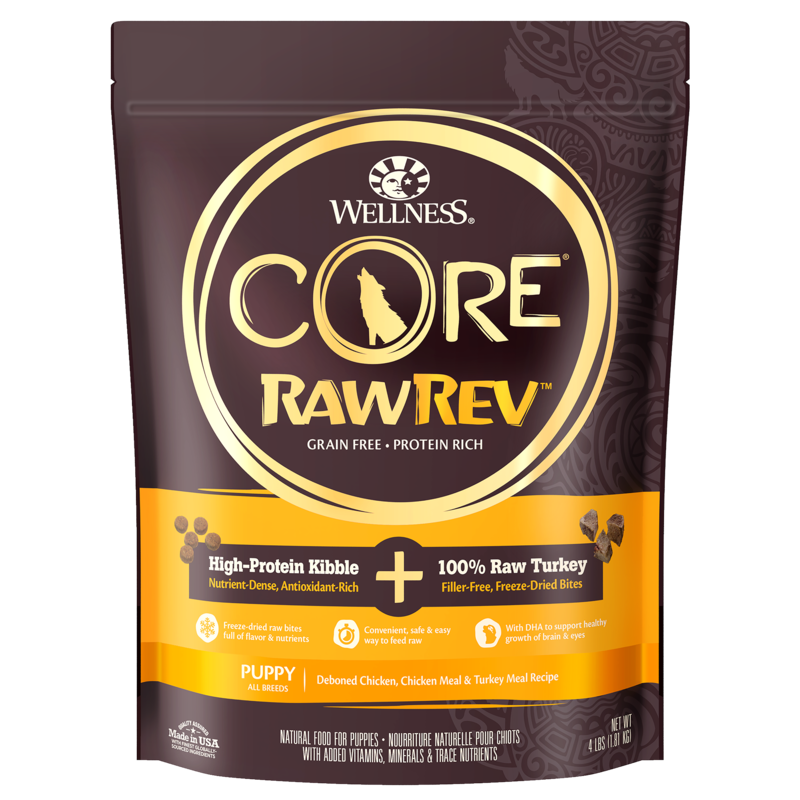 CORE RawRev Puppy allows you to add raw easily and safely to every meal. Our puppy recipe contains optimal protein, calcium and phosphorus to support healthy bone and muscle growth, along with DHA to support brain and eye development. 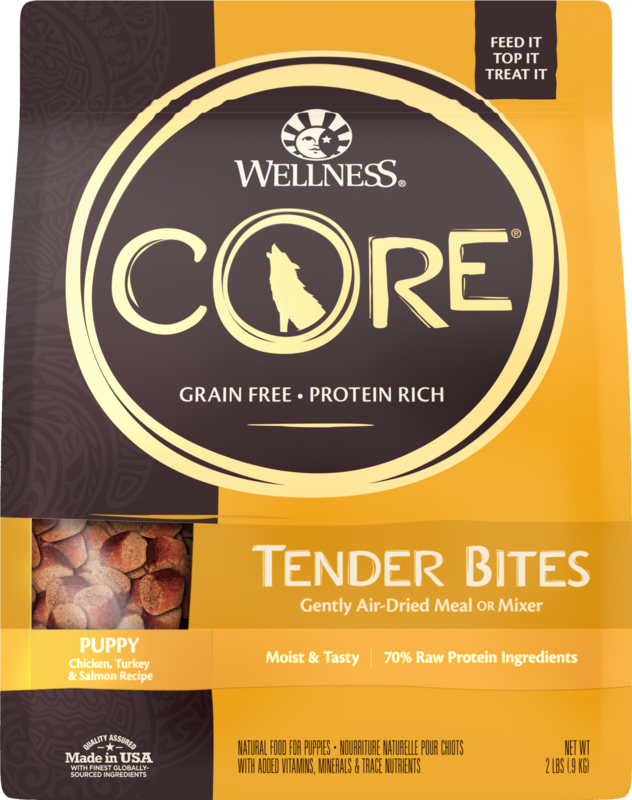 High-protein, grain free kibble is combined with 100% raw meat pieces to create a savory, nutrient-rich meal packed with everything your puppy needs to thrive from the CORE. Deboned Chicken, Chicken Meal, Turkey Meal, Potatoes, Peas, Potato Protein, Chicken Fat (preserved with Mixed Tocopherols), Turkey Hearts, Dried Ground Potatoes, Tomato Pomace, Natural Chicken Flavor, Salmon Oil, Ground Flaxseed, Salt, Potassium Chloride, Vitamin E Supplement, Choline Chloride, Taurine, Bananas, Mixed Tocopherols added to preserve freshness, Zinc Proteinate, Zinc Sulfate, Calcium Carbonate, Niacin, Iron Proteinate, Ferrous Sulfate, Spinach, Broccoli, Carrots, Parsley, Apples, Blueberries, Kale, Sweet Potatoes, Beta-Carotene, Vitamin A Supplement, Copper Sulfate, Thiamine Mononitrate, Copper Proteinate, Manganese Proteinate, Manganese Sulfate, d-Calcium Pantothenate, Sodium Selenite, Pyridoxine Hydrochloride, Riboflavin, Chicory Root Extract, Yucca Schidigera Extract, Vitamin D3 Supplement, Biotin, Calcium Iodate, Vitamin B12 Supplement, Folic Acid, Ascorbic Acid (Vitamin C), Dried Lactobacillus plantarum Fermentation Product, Dried Enterococcus faecium Fermentation Product, Dried Lactobacillus casei Fermentation Product, Dried Lactobacillus acidophilus Fermentation Product, Rosemary Extract, Green Tea Extract, Spearmint Extract. 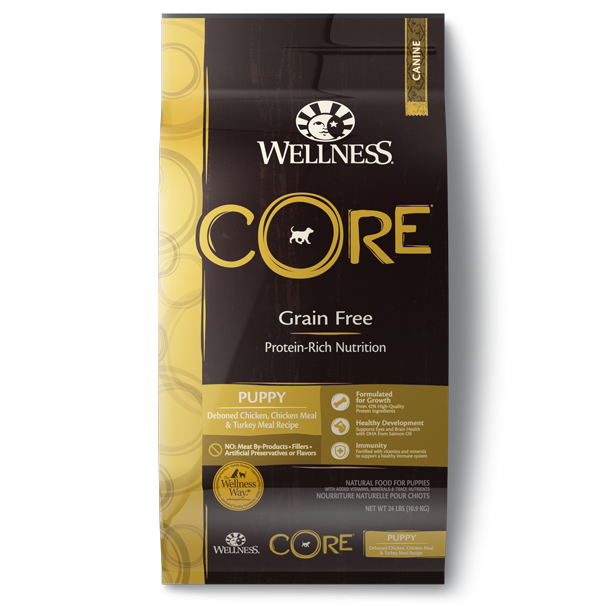 Wellness CORE RawRev Puppy Deboned Chicken, Chicken Meal & Turkey Meal Recipe is formulated to meet the nutritional levels established by the AAFCO Dog Food Nutrient Profiles for growth and gestation/lactation including growth of large size dogs (70 lbs or more as an adult). COMBINATION FEEDING: If feeding with Wellness wet food, reduce dry amount by ⅓ cup (37 g) for every 6 oz (170 g) of wet food. FOR PREGNANT OR NURSING DOGS: Since DHA is transferred to puppies in mother’s milk, we recommend feeding this during pregnancy and nursing. When pregnant, feed up to 50% more food according to body weight at 12 mos. For nursing dogs, allow her to eat at will. Every dog is a little different, so optimal feeding amounts may vary with age, size, activity level, breed and environment. Please use feeding guidelines as an initial recommendation and adjust as needed. Calorie Content: This food contains 3,839 kcal/kg or 422 kcal/cup ME metabolizable energy) on an as fed basis.